Boccia is an inclusive sport which can be played as a recreational activity, as a competitive sport and/or as an activity to help individuals with disabilities and health problems to develop their confidence, self-esteem, physical and mental health and different social skills. It requires at least two players, where it can also be played with two teams of 2-3. It is played on a court with 13 balls (6 red balls, 6 blue ball and 1 white jack ball). Players have to sit down during each match, although depending on their class, players can have assistants with them if they need them and can play as well with ramps if they find it difficult to throw, roll or kick a boccia ball. A pairs match for individuals with a BC4 classification. 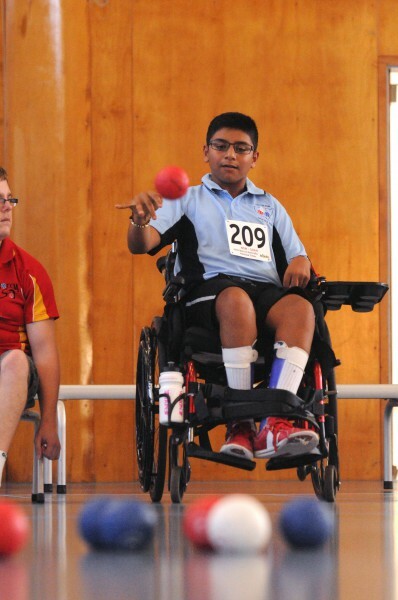 Boccia competitions also occur locally, nationally and internationally. Also, the format of the team and pairs matches may different slightly on recreational, local or national level depending on the organizers. Boccia is inclusive to all individuals with different disabilities; however, only individuals who have a physical impairment which affects their functional ability pass a certain degree, and where all four of their limbs have been affected, are allowed to compete internationally. BC1 – for individuals who can throw, kick or roll a boccia ball, but have limited functional ability which then affect their mobility and their game. Such individuals may have moderate to severe problems with their grip and hand function, has difficulties changing position in their chair, and is mostly dependent on a wheelchair or a powerchair for day to day activities. Apart from the delivery of the ball, individuals within this classification are allow assistants to help them during any match. BC2 – which are individuals similar to individuals in BC1, but have more functional ability. Such individuals may have more stability and can walk short distances, but may still use a wheelchair or a powerchair for day to day activities. Such individuals would also be affected in all four limbs and no overall control of their function or stability. BC3 – for individuals with Cerebral Palsy which have been affected in all four limbs and their functional ability affect them to an extent where they have difficulty to throw, kick or roll a boccia ball. Such individuals may find impossible to throw, roll or kick a ball due to severe grip problems and/or difficulty in releasing a ball at a certain point to get it to a certain position on the court. As a result, individuals in this category will use a ramp to help them play as well as an assistant to help them with the ramp, placing the boccia balls on the ramp and smoothing out the outer surface of the player’s boccia balls before delivery. BC4 – for individuals who do not have Cerebral Palsy but do have a moderate to severe impairment which affects how they deliver the boccia ball. Individuals within this classification will have conditions that have altered their physiology, coordination, functional ability and stability. For example, individuals with Spinal Cord Injuries, Muscular Dystrophy and other conditions. Due to their condition, individuals within this class can either use a ramp or throw, roll or kick a boccia ball. Within some countries, individuals who have a physical impairment but don’t fit into any of the categories above, can still play Boccia as a BC5 and BC6 but wouldn’t be able to play internationally. Also within some countries, the Boccia’s classification system may also have a BC7 class for individuals with visual impairments and a BC8 class for any individuals with intellectual impairments.